Today is a challenge day at Whimsy, the theme for the challenge is Vintage or Shabby Chic. An easy enough challenge I think. 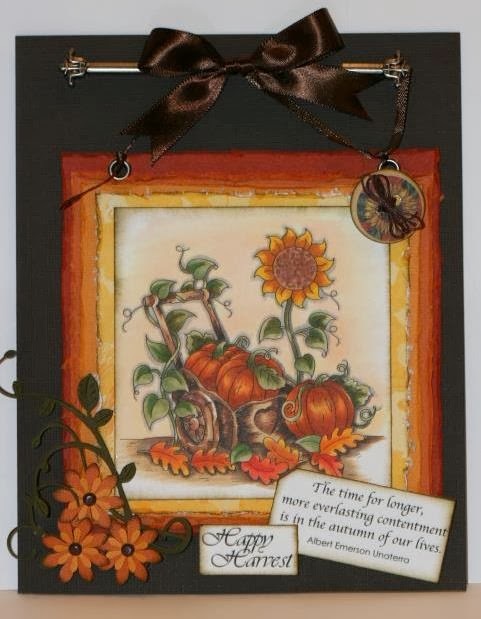 I decided to use this wonderful digital image Called Autumn Wagon from the talented designer Kathryne from Stamp Art Design. 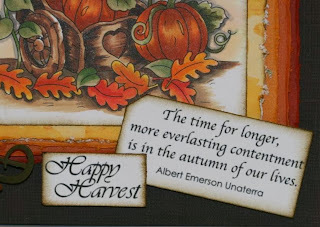 A very fitting image considering it's harvest time, so I distressed the edges, inked and chose fall colors to make my card. I would love to see you enter our challenge on the Whimsy Challenge for a chance to win great digital images. That are easy to work with and come from some very talented designers. You can pop over to the Whimsy Store to check out all the great digital images. A closer look at some of the wonderful saying that you get with this image. Supplies: Bazzill cardstock, Bo Bunny patterned paper, distress ink, Offray Ribbon, Graphic 45 Button, copic markers, eyelets, miscellaneous metal bar. Sure is pretty friend, I shared it on FB...so everyone that I know could see it...great job, love the colors!